The traction pattern of the Adidas D Rose 773 IV is loved by a good number of users because of its good stopping power. Many appreciate that these Adidas basketball shoes do not squeak much. The Bounce in the midsole is comfortable according to many. The mesh upper makes the shoe breathable, wearers notice. A large number of buyers like the versatility of the Adidas D Rose 773 IV. Some find the simple design of these Derrick Rose basketball shoes appealing. The materials used in the shoe make it lightweight, claim most wearers. A lot of users are happy with the affordability of these Adidas shoes. The straps on the rear panel adds a nice touch to the shoe’s look. The rubber outsole of the Adidas D Rose 773 IV is not durable enough for outdoor plays, say some reviewers. A few users leave comments that there is too much dead space in the toe box area. A small number of buyers lament that the straps on the rear panel are useless and are just for aesthetics. Ankle lockdown is not good, claim a couple of wearers. The grooves on the outsole are tight and dust gets stuck in them easily. This causes the shoe to lose traction. These D Rose shoes run narrow like the 11th Kevin Durant sneaker according to some purchasers. Overall, the Adidas D Rose 773 IV is a great performer. Many consider it a team shoe because it suits any position. The shoe is flexible and responsive enough for guards. It also delivers the impact protection and support that bigger players need. Getting all this goodness for only $110? No one will complain, for sure! If you are on a tight budget but want to have a pair that can last more than a season, the Adidas D Rose 773 IV is perfect for you. These might be good for a bigger guy or a post player. Bang for your buck AND a solid team model. It’s an affordable D Rose model that I think a lot of people would find enjoyable to play in. The Adidas D Rose 773 IV is a mid-top basketball sneaker equipped with the Bounce technology in the midsole. It provides a sufficient amount of responsiveness, support, comfort, and impact protection. The outsole has a translucent rubber with multidirectional herringbone pattern for superb court grip. The upper’s breathability is provided by the very materials that it is made of: mesh and perforated synthetic leather. As a worthy alternative to the D Rose 773 IV, you can get the HOVR Havoc from Under Armour's roster of performance shoes for basketball. 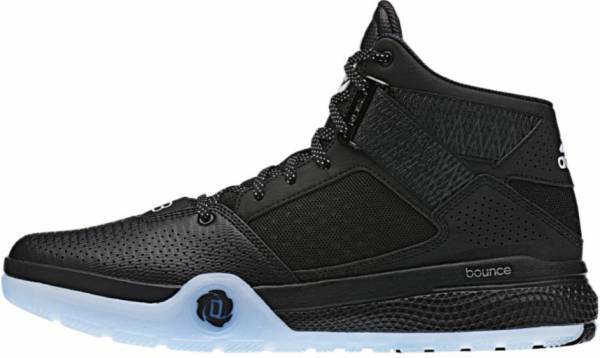 It is a high-top basketball shoe that provides the same amount of comfort as the D Rose 773 IV. It also comes with a mesh upper and a standard lace-up closure. Cushion. The Adidas D Rose 773 IV is packed with Bounce cushioning in the midsole. The technology delivers a comfortable ride to the wearer along with good impact protection. Traction. The outsole of the Adidas D Rose 773 IV is made of a non-marking and translucent rubber. It features a shallow, segmented, and multidirectional herringbone pattern. The traction is designed to provide a good court grip and prevent court slippage. The pliable grooves on the outsole can hold out against dusty courts. Length and Width. The Adidas D Rose 773 IV comes in the normal width and length. User reviews vary depending on the structures of the reviewers’ feet. Therefore, it is still best to fit the shoe before purchasing. Lockdown. To securely hold the shoe in place, the flat shoelaces of the Adidas D Rose 773 IV can be adjusted. The tongue is nicely padded for a more comfortable and supportive fit. The upper of the Adidas D Rose 773 IV consists of synthetic leather and mesh. The mesh material and perforations in the toe box make the shoe well-ventilated. The shoe has an internal TPU heel counter for support and heel containment. For comfort in the ankle area, the inner of the shoe is lined with thick padding. The Adidas D Rose 773 IV is a mid-top that comes in numerous colorways. To display the technology used in the midsole, the bounce callout is found on the lateral side. Derrick Rose’s logos are found on the tongue, insole, outsole, and lateral side. The 773 callout on the toe box signifies Derrick Rose’s home state Illinois.